There is much controversy around the subject of Bach’s keyboard works being played on the modern piano. Purists may not approve, but Bach himself was a prolific arranger and transcriber and was not averse to transferring music from one instrument to another. At the end of the day, it’s all a matter of personal taste whether you like to hear your Bach on a harpsichord or piano. Personally I favour the latter. Played with skill and sensitivity, the modern piano can invest the music with colour and reveal with clarity the contrapuntal textures. Pianists like Rosalyn Tureck, Murray Perahia, Andras Schiff and Glenn Gould have certainly won my admiration. I would include in this illustrious group the Russian pianist Tatiana Nikolayeva, who is the focus of this new release from Doremi. She was born in Bezhitz in 1924 and began playing the piano at the age of three. She eventually went on to study with Alexander Goldenweiser at the Moscow Conservatoire. In 1947 she began touring the Soviet Union, and three years later in 1950 won the Leipzig Bach Festival, where she met and formed a friendship with Shostakovich. He wrote his 24 Preludes and Fugues, Op. 87 for her. Later, perestroika enabled the pianist to tour more extensively, opening up Europe, America and Japan to her wonderful artistry. She also took up a teaching post at the Moscow Conservatory in 1959. She died in San Francisco in 1993 after suffering a cerebral haemorrhage whilst giving a concert. The keyboard concertos were recorded live in concert over three days in December 1975. As far as I know, the six concertos for solo piano and strings BWV 1052-1058 are making their first CD outing, whilst the concertos for two, three and four pianos and strings have recently been released as part of a 37 CD box set issued by Scribendum. The audiences on each occasion were well behaved and I could detect their presence only from the applause at the end of each work. 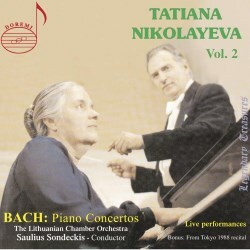 Those who admire Nikolayeva’s Bach playing will find much to enjoy in this 3 CD set. The pianist’s Bach performances and recordings were legendary, as was her artistry. The concertos’ outer movements are buoyant and animated, and benefit greatly from her lightness of touch, delineation of lines and crisp articulation. The finale of the D minor BWV 1052 is exuberant and vibrant and has a compelling sense of forward momentum and urgency, and bristles with energy. Yet it is in the slow movements that her star really shines. Take for instance the Adagio e piano sempre of the D major Concerto, BWV 1054. Not only is her phrasing natural and intelligently shaped, but she radiates an expressive warmth. Her beauty of tone is quite remarkable. The same can be said for the Largo of the F minor Concerto, BWV 1056, which is on a par with Edwin Fischer’s famous recording. The concertos for more than one piano are every bit as fine. Their attraction lies in their abundant lyricism, uplifting and life-enhancing qualities and the stunning virtuosity they offer from the keyboard players. Her collaborators, Mikhail Petukhov, Marina Yevseeva and Sergei Senkov, step up to the mark admirably and blend well, feeding off each other. The Concerto for Four Pianos and String Orchestra in A minor, BWV 1065, an adaption by Bach of Vivaldi’s B minor Concerto for Four Violins and String Orchestra, is my particular favourite, allowing each player their moment in the sun. All the works are given utterly convincing readings. The Lithuanian Chamber Orchestra under the direction of Saulius Sondeckis give sympathetic support throughout. The balance between soloists and orchestra I couldn’t argue with. The sound quality has truly come to life in these new remasterings by Jacob Harnoy and Clive Allen. The bonus tracks are taken from a solo recital Nikolayeva gave in Tokyo in April 1988. I’m personally not a great fan of the Toccata and Fugue in D minor, BWV 565 played on the piano. It loses much in translation. The main work is the Partita No. 2 in C minor, a mighty edifice, orchestral in conception. The Sinfonia, which opens the Partita, is noble and grand. In contrast, there’s an air of serenity and resignation in the Sarabande. A scintillating Capriccio ends the work with verve and vigour. The other two items from The Musical Offering and The Art of Fugue are beautifully played and reveal some captivating hues and sonorities.